Just like humans, dogs have a soft spot for some outdoor adventure. If you love hiking, it is high time to bring your doggie along. The best way to carry your pooch for a long hiking trip is by using a dog backpack carrier. Ideally, the best dog backpack carrier for hiking makes it easy and convenient to show your dog around. Other than accommodating your dog, some carriers include side pockets that offer more storage room for a few more accessories or supplies. In this article, we are going to narrow down on some of the factors to consider when choosing a carrier. Besides that, we will review some of the best dog backpack carriers. What is the best dog carrier? Fit for all sizes and shapes, Ventilation provided, Side pockets for gear organization, Moisture absorbing. Enough ventilation to provide cool, Comfortable with padding, Durable and attractive, Straps are adjustable, Legs and tail out design. Safe and comfortable for your pet, Mesh panels provide ventilation, Zip pockets, Drawstring to secure your furry friend, Suitable for small dogs. Extra security with buckle and leash, Shoulder straps padded for comfortable hauling, Quality and durability guaranteed. Airline approved carrier, Easy to carry and travel, More durable and secure, Guaranteed airflow, Quality and stylish material, Escape proof. 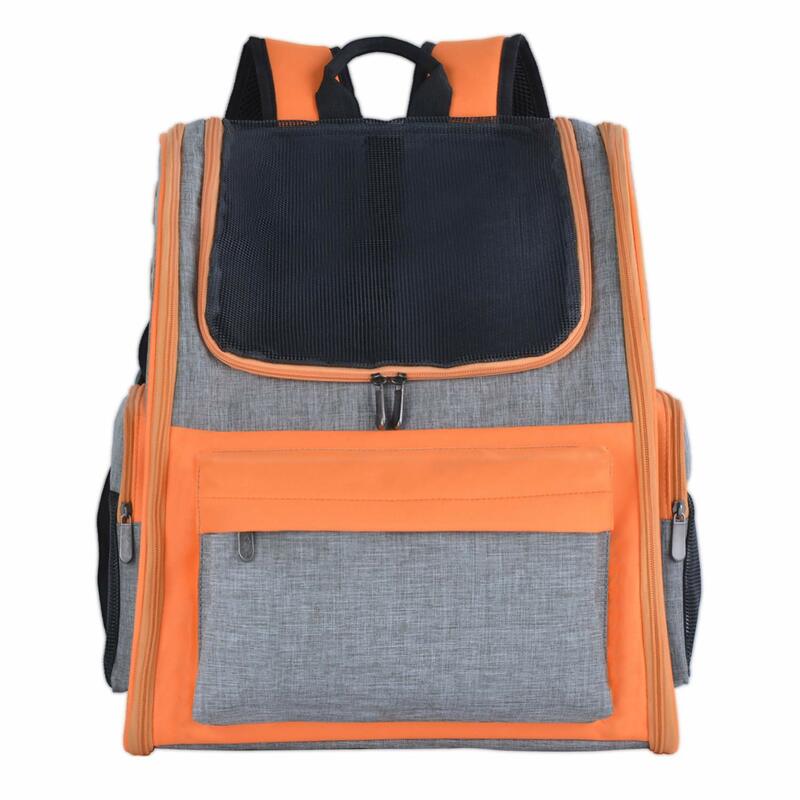 Size : 17.3" H 13" W 10.6"L, Window with mesh for ventilation and safety, Adjustable shoulder straps, Additional security with drawstring, Comfortable material. Size : 13.4" L 12" W 16.9" H, Stylish design, Airline approved for keeping under seat, Air holes and mesh for ventilation, Snap hook for safety, Easy to clean, Big space. Five in One Versatile function, Can be folded with one hand, Robust wheels, Easy to store and carry, Comfortable for pets and user, Easy to switch between functions. Comes in three size, Choose as per size of dog, Comfortable and durable, Straps with adjustment, Draw string for extra security, Extra padding for comfort. Mesh pockets. Large size: 14.76" L 10.43" W 16.93" H, Comfortable breathable mesh, Side pocket and front pockets, Padded straps for comfortable carrying, More gear organization. What are the best dog backpack carriers? The K9 Sport sack offers an impressive vet approved dog backpack carrier ideal for outdoor excursions. Beside the pack being available in different sizes, it also comes in a variety of colors. Unlike your ordinary dog carriers, the K9 sport sack feature with a string of safety attributes including an avalanche whistle clip for you and your dogie. Alongside that comes dual sized pockets as well as ventilated side panels. More ventilation is applied on the shoulder straps. In fact, The K9 Sport Sacks are loved for its safety features and exceptional comfort. Sturdiness and unmatched durability are some of the qualities that define the Pawaboo Pet Carrier Backpack. For strength, the carrier is constructed out of the finest polyester fiber. Maximum ventilation is guaranteed by a breathable mesh on the back panel. Similarly, the carrier allows seamless air circulations in the interior through dual mesh panels on the sides. Fitting your dog into the carrier is easy owing to strong and highly functional zippers as well as an elastic opening. It also comes with a hook and loop. 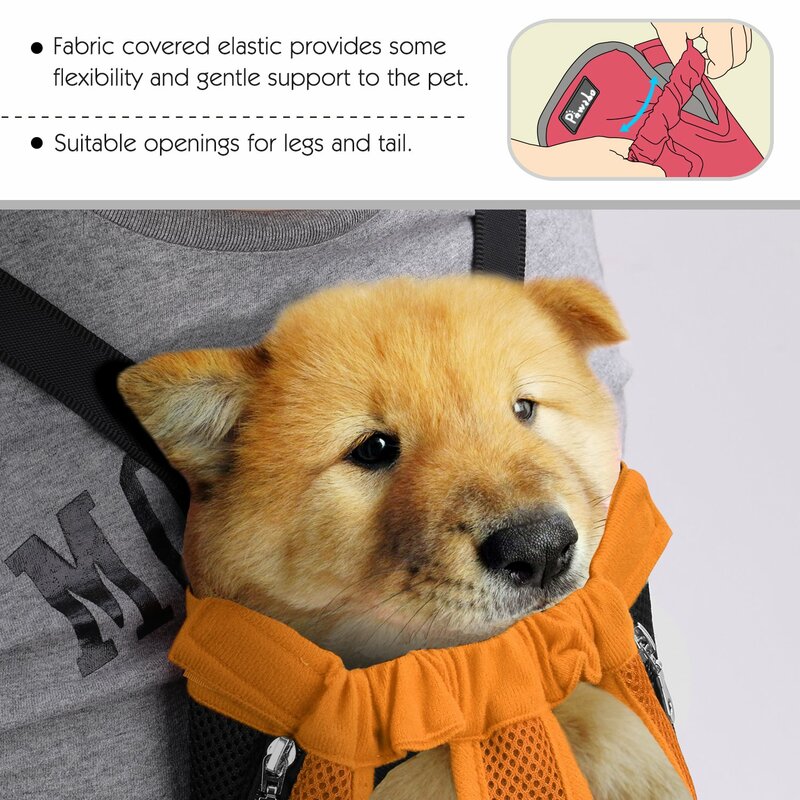 In addition to that, the carrier is fitted with functional buckles on its straps allowing your dogie to slip in effortlessly. Another great feature is the tail-out and legs-out design which heightens comfort for your furry friend. 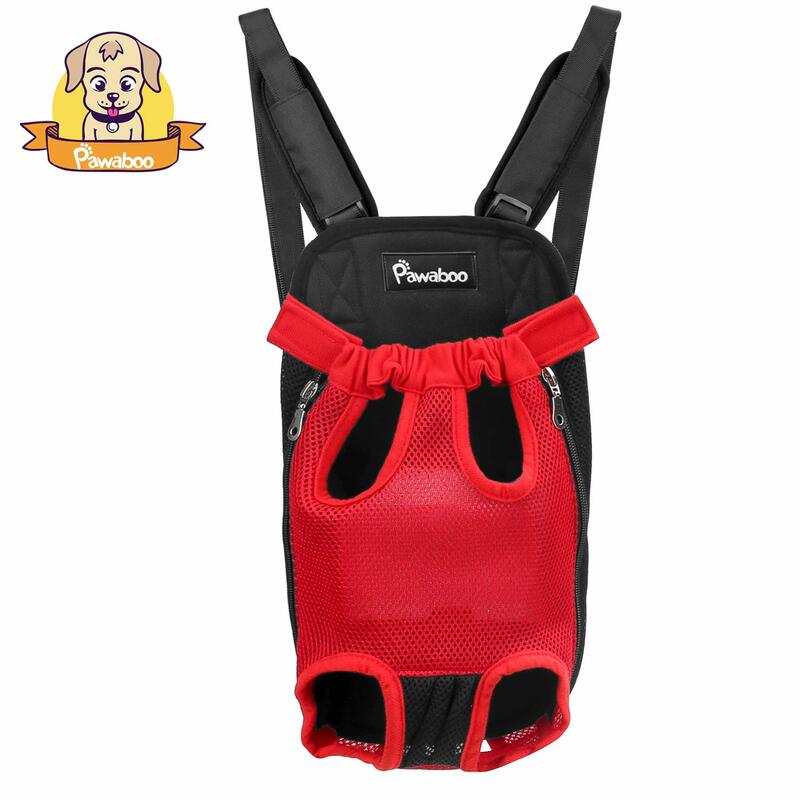 To top it off, the carrier includes thickly padded and adjustable straps that minimize pressure around the dog’s neck and shoulder area. 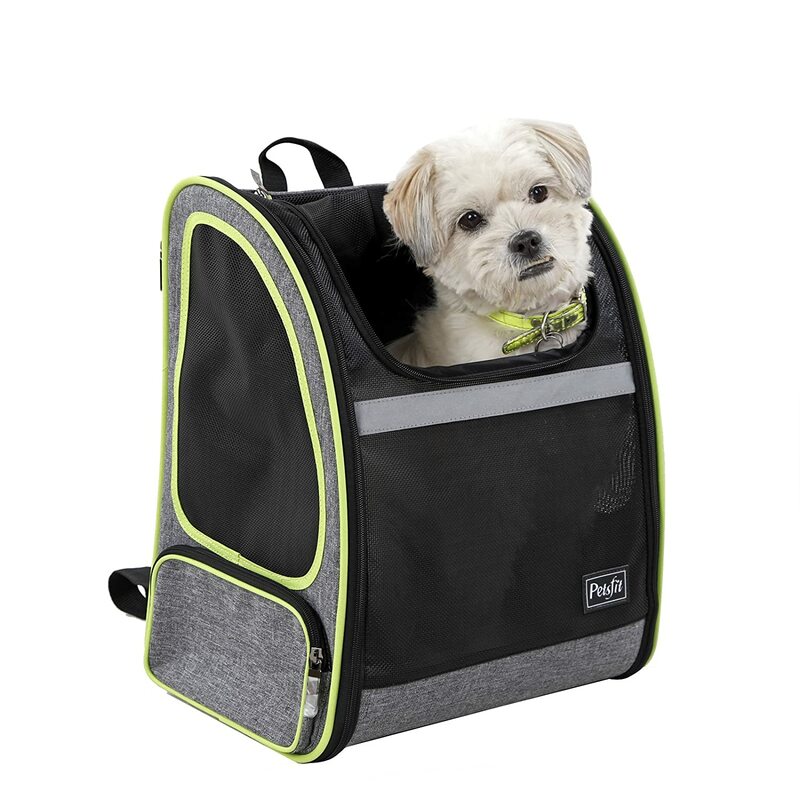 In fact, The Pawaboo pet carrier is an incredible backpack with an impressive design for small dogs. Nothing guarantees exceptional comfort and safety for your little dog like the Outward Hound Pooch Pouch. 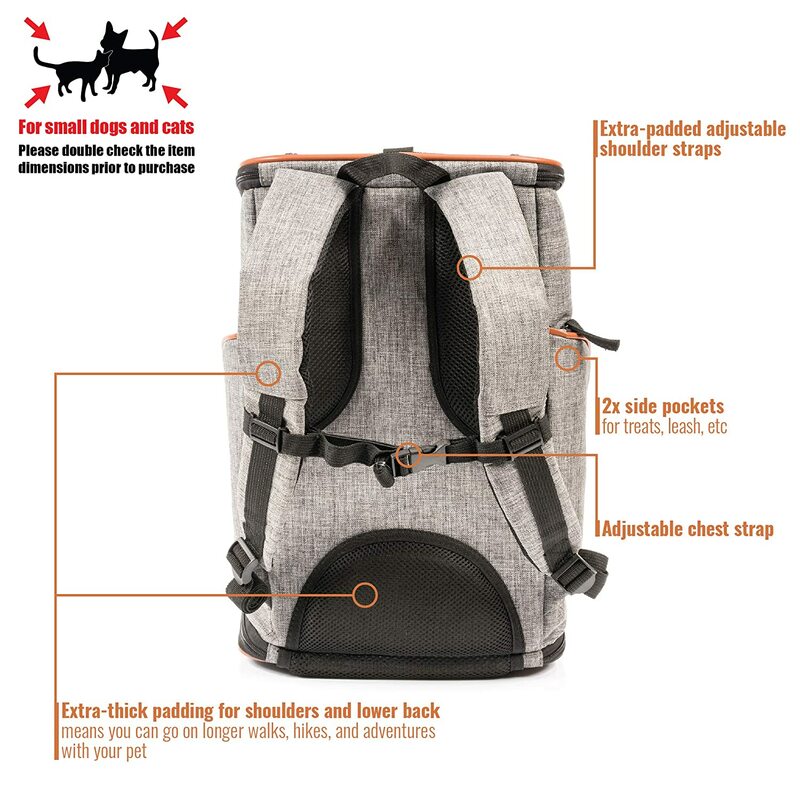 It is one of the most convenient small dog carrier front pack in the market currently. Nonetheless, it comes with numerous premium features for world class performance. This includes breathable mesh panels on the sides to improve circulation of air. Additionally, the carrier is made with durable nylon fabric that is water resistant. Likewise, it comes with a drawstring top and a safety harness attachment for optimum security. 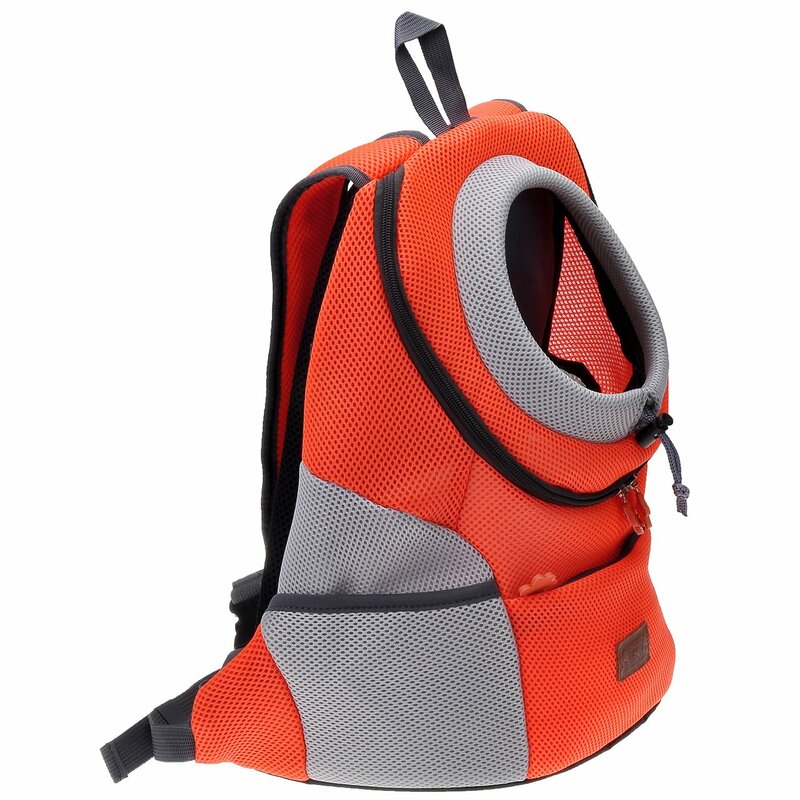 Comfort for the carrier is not questionable owing to extensive cushioning on the pouch bottom, straps and back panel. Lastly, it is strong enough with a capacity to accommodate a dog of up to 15 pounds. 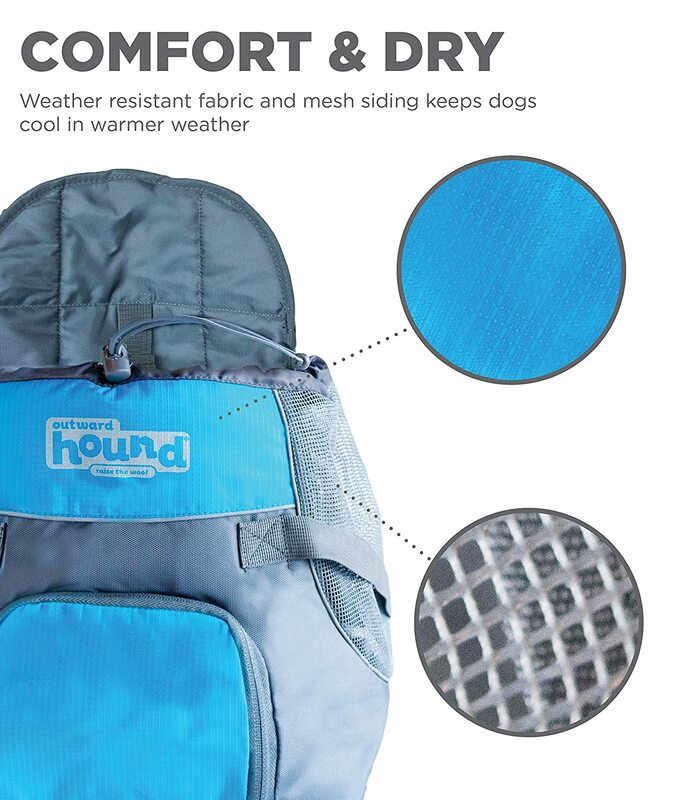 In fact, The Outward Hound PoochPouch is precisely what you need for your next outdoor excursion. 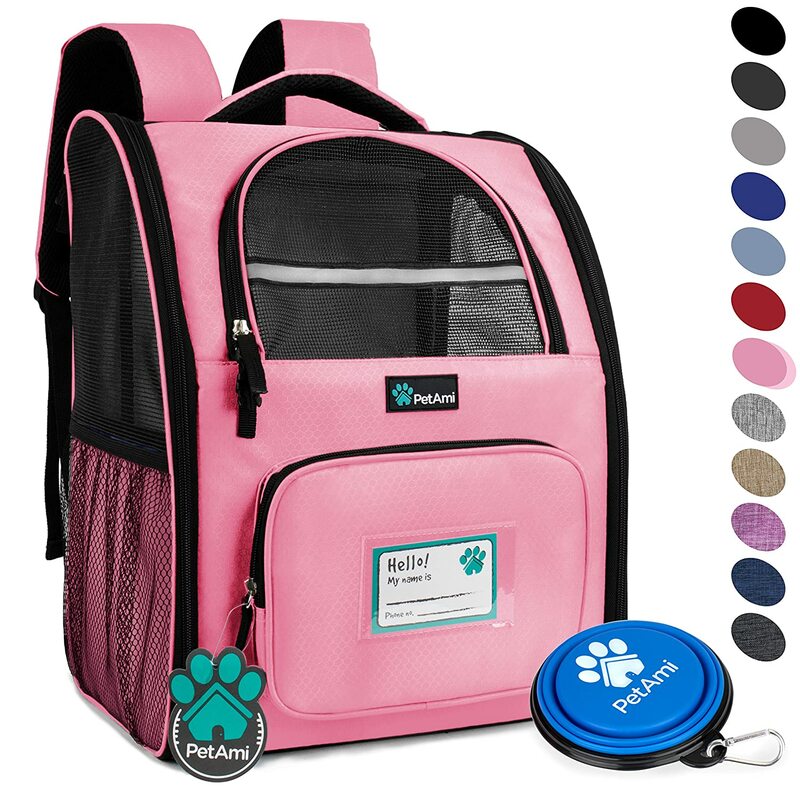 The PetAmi deluxe is a premium quality dog carrier backpack with a dimension of 16.3 inches high, 10.2 inches wide and 12.5 inches long. The creators of the product had the interest of your dog at heart as it provides ultimate comfort. Its unique two-way entry allows easy access to the dog’s compartment. 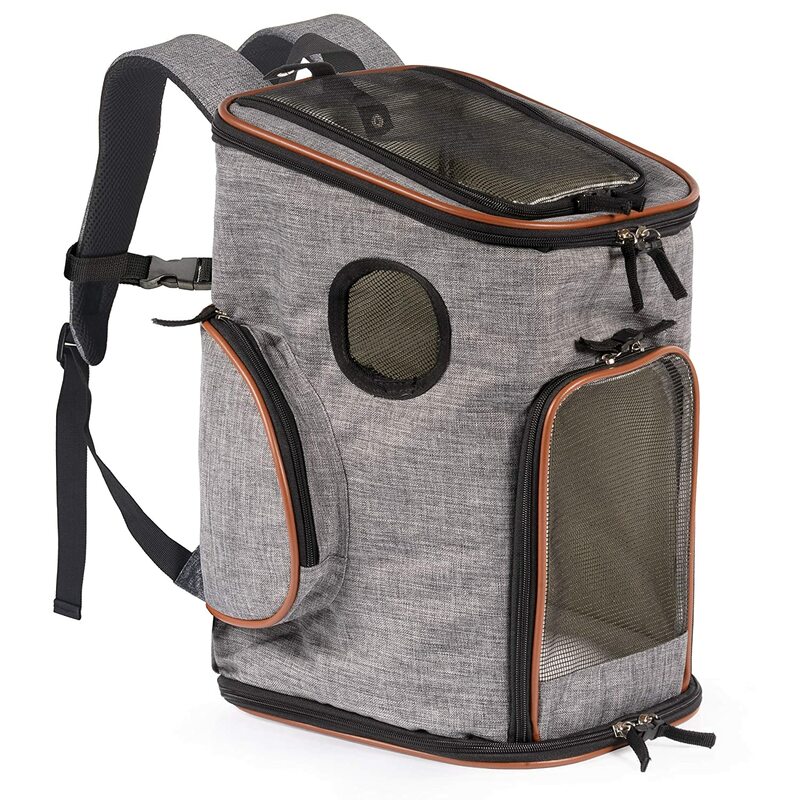 Moreover, it comes with a zip up mesh window which ensures visibility in addition to availing more headroom for the pet. Moving on, the carrier has a firm structure which eliminates any risk of the bottom collapsing whenever the dog gets in. Similarly, the plastic reinforced structure makes it possible for your pooch to move around and explore the surrounding comfortably. On the other hand, the pack is highly breathable to keep your dog cool. Side pockets provide extra packing space. In fact, The PetAmi deluxe pet carrier is a premium backpack that will blow away your mind with its unmatched functionality. Hiking enthusiasts have a reason to smile now that they can conveniently hit the trail alongside their chubby pals courtesy of the Pawfect pet carrier. One of the most outstanding features of the pack is the thickly padded shoulder straps and back panel. It is made with quality and sturdy claw proof material which will keep your pet secure at all times. Furthermore, the dog compartment has a leash where a dog’s collar can be attached. This further enhances your dog’s security. The top cover of the carrier can be unzipped for some fresh air for your pooch. Strong buckles improve accessibility. It is also amazing to note that the carrier folds flat making it easy to store. 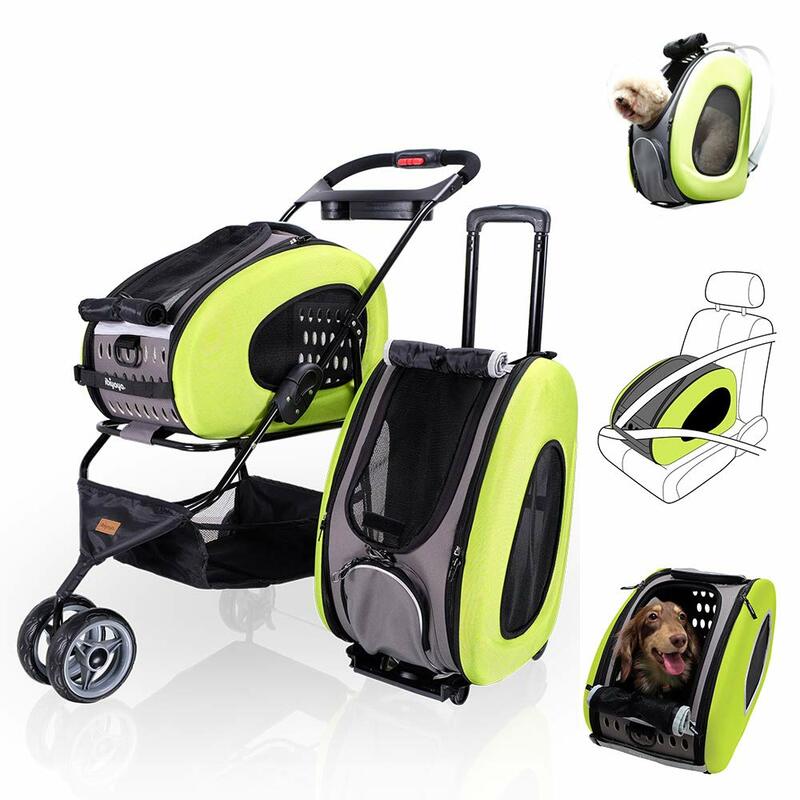 In fact, The Pawfect Pets Soft-Sided Pet Carrier is worth buying owing to its prime quality and durability. Another mind blowing product on the list is the Petsfit comfort carrier. Just like the name suggests, it is designed to provide premium opulence for your pooch. It is easy to carry around not to mention the level of security that it offers. The carrier comes with chest and waist straps that are thickly padded for a less strenuous hiking experience. A robust Oxford fabric ensures admirable durability. Moving on, the carrier has a soft fleece on the interior. The fleece is also breathable to keep your doggie cool, dry and comfortable. For easy maintenance, the carrier is washable. 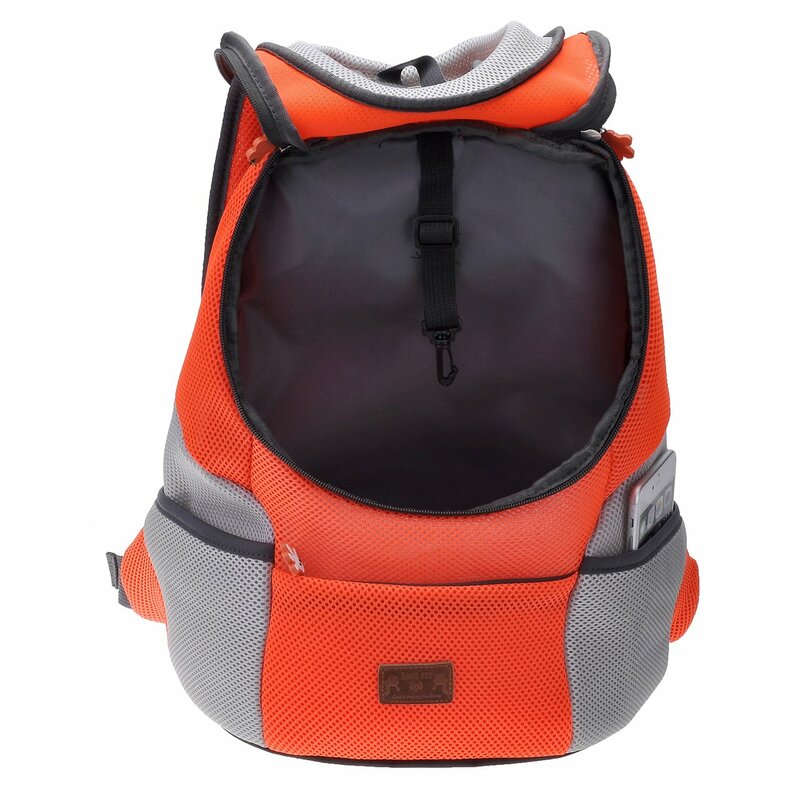 The backpack features four mesh windows which provide sufficient ventilation. Likewise, the windows provide your dog a good view of the surrounding. In fact, This dog carrier guarantees value for your money by offering kingly opulence in addition to serving you for long. . The Petrip carrier is a perfect hiking backpack for small breed dogs such as the Chihuahua, mini Poodle, Yorkshire and the Pomeranian. Not only it is ideal for long hiking trips, but also outstanding for its incredible functionality. It comes in a variety of sizes with the largest one having the capability to accommodate up to 12 pounds. Carrying the backpack is easy regardless of the distance owing to soft and well cushioned shoulder straps. Similarly, the shoulder straps are highly adjustable thus providing a customized fit. Nonetheless, the front hole is fitted with a drawstring that makes it possible for one to adjust it depending on a dog’s size. The carrier features an interior buckle where a pet’s collar can be connected for maximum security. In fact, Your pooch deserves the best carrier and the PETRIP dog backpack carrier does not disappoint. 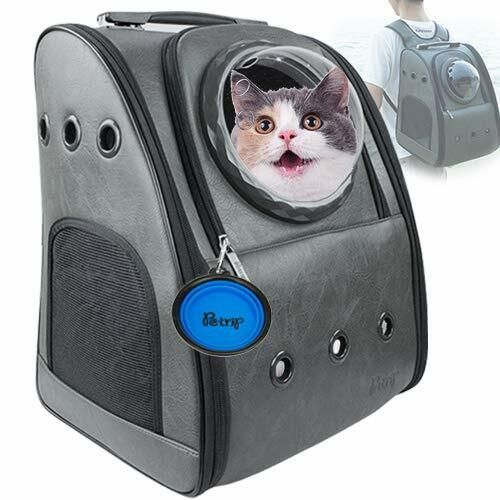 Unparalleled versatility and top functionality is what you get from the ibiyaya multifunctional pet carrier. 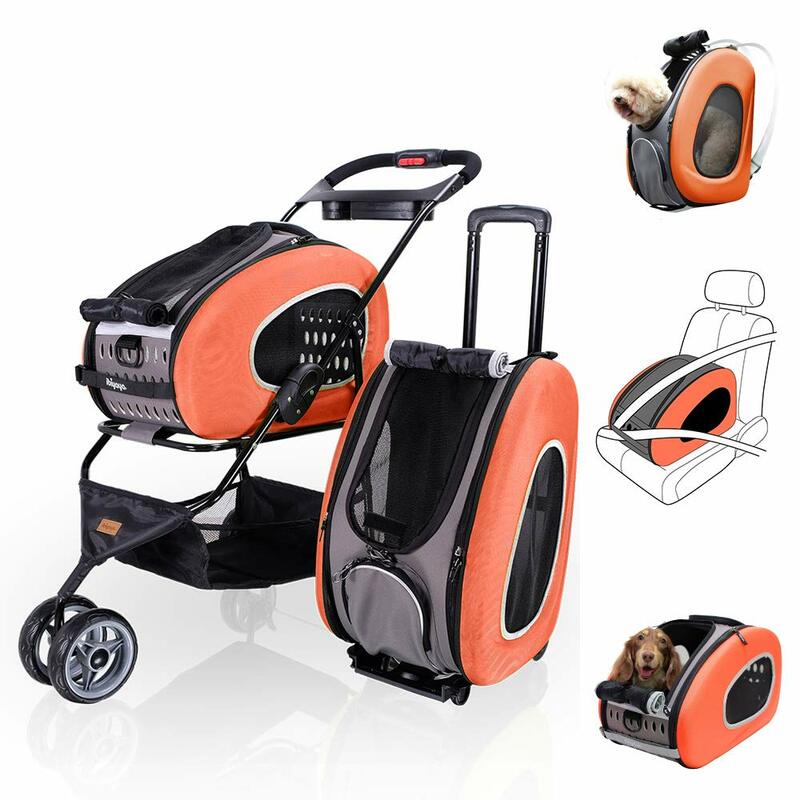 Besides being used as a regular pet carrier, it can also be utilized as rolling carrier, stroller, car seat and backpack. Moreover, the backpack has 360 degrees swivel front wheels as well as rear brakes for safety. It is made from quality and environmentally friendly material. For maximum ventilation, it incorporates mesh windows. Large openings into the cockpit enhance accessibility. 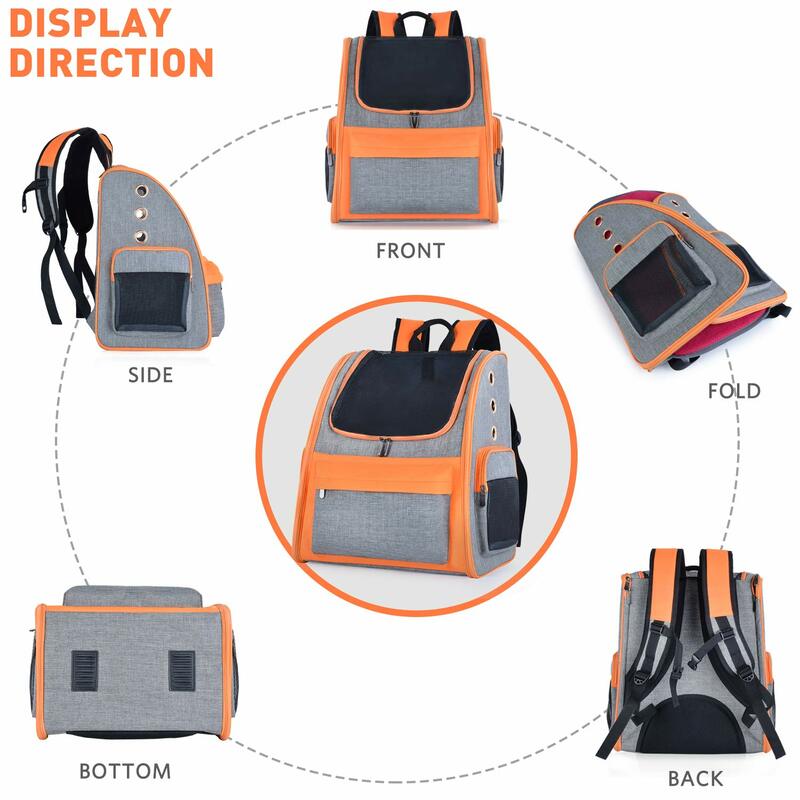 In fact, If you are looking for a versatile carrier with admirable functionality then the ibiyaya backpack is perfect. The Mogoko carrier outperforms most products in terms of quality, comfort and functionality. It features a unique head out design that allows your dog to get fresh air and also explore the environment. The shoulder straps are well cushioned to offer kingly comfort on long hiking trips. 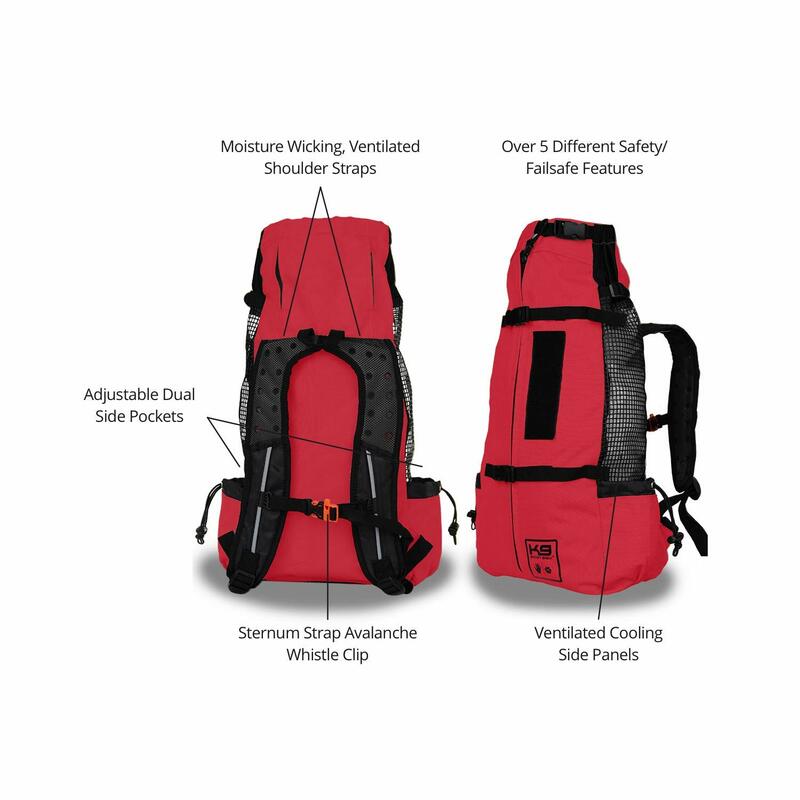 For stability, the pack incorporates buckles and sturdy waist straps. Premium polyester fiber guarantees durability. The Mogoko carrier is extremely lightweight, making it easy to carry. In addition to that, the carrier is fitted with an internal rope onto which a collar can be attached to prevent the dog from falling. Eventually, side pockets provide extra packing space. In fact, The mogoko carrier is a pocket friendly hiking backpack engineered to keep your pet secure and comfortable. Opulence and an ergonomic design make the Legendog carrier a favorite among most hikers. Its straps are easily adjustable thus providing a custom fit to the wearer. Comfort is boosted by wide and thick cushioning on the shoulder straps. Additionally, the carrier is made with quality material that also turns out to be water resistant. The interior is soft and well-padded for the pet’s comfort. In fact, It is a convenient dog carrier for long hiking trip with an innovative design for a memorable hiking experience. What is the importance of best dog backpack carrier? There are numerous advantages of carrying a dog backpack carrier. To begin with, you can use the carrier to show your young or little pet around the jungle. Moving on, most hiking terrains are marred with rough and unforgiving surfaces. Such conditions might not be favorable for your canine as they might inflict injury. A carrier can secure your pooch in such a scenario. 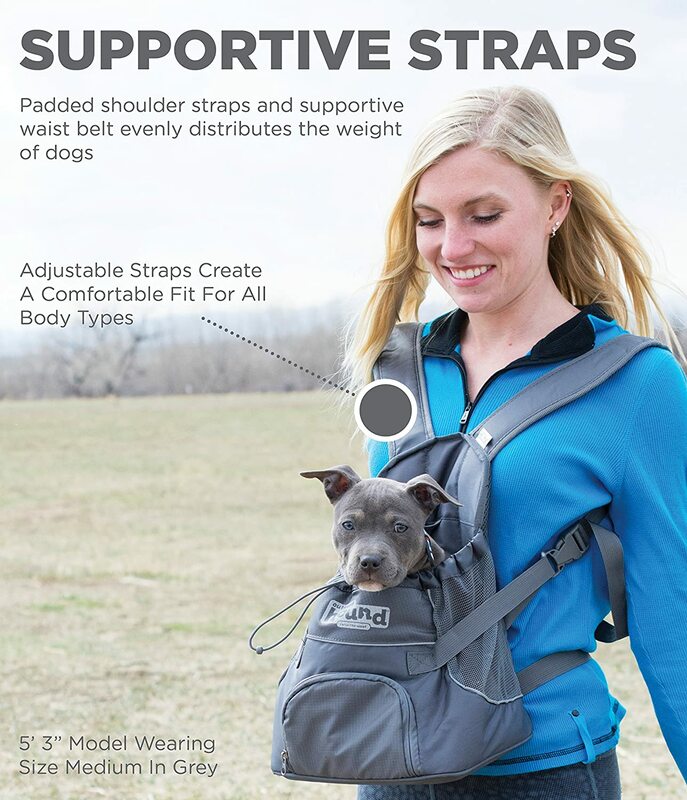 Similarly, you can use the backpack to carry a dog that is worn out during an excruciating exertion. On top of that, rather than carry the dog’s supplies in your hand, you can go easy with a spacious dog backpack carrier. It will give you an easy time as all the weight will be distributed on the shoulder and back rather than wearing down your hands. 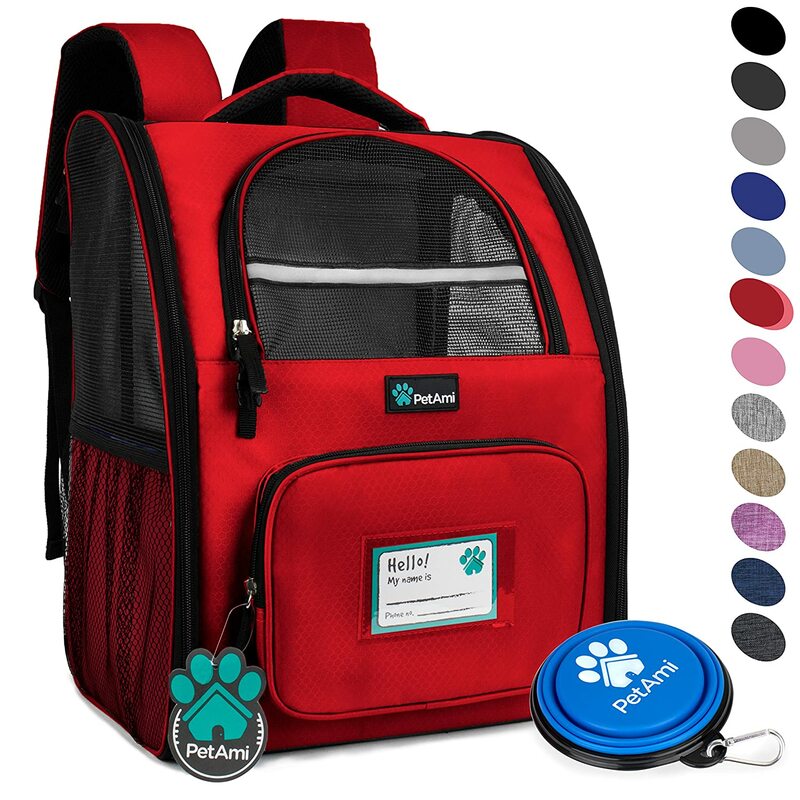 How do you choose a best dog carrier backpacks? Always, the carrier’s size should complement the dog’s size to enhance its security. A bag that is too big might increase the chances of your dog falling, while one that is small will cause discomfort. Thus, ensure that you get your dog’s measurements before purchasing a carrier for your pet. A bag that might break or tear while on an excursion is the last thing anyone would wish for. You ought to choose a backpack that can accommodate your dog’s weight for the duration it stays in there. Nonetheless, do not focus solely on the maximum weight that a bag can hold as it might be deceiving. Consider the dog’s size as well. No doubt, the position in which your dog will be held in the backpack matters a lot. While some carriers have the dog lie down within an enclosed area others allow it to be held in a sitting position with the head sticking out. The former has proven to be more ideal for long hiking trips. Some carriers incorporate the ‘legs out’ design which is more appropriate for short excursions. Backpack carriers tend to become heavier and less comfortable as the hiking trip gets longer. This is why the straps should be thickly padded to reduce the pressure induced on your shoulders. Choose a carrier that is extensively padded with thicker and ergonomic straps. Another feature that you should look out for when choosing a backpack is the wheels. Wheels provide the option of dragging the bag along rather than just having it on the shoulders. You can imagine hiking in the boiling sun. Not only will this kind of weather get you drenched in sweat, it will also make your pooch uncomfortable since dogs are highly prone to overheating. Your best option is to choose a backpack that is sufficiently ventilated. A breathable mesh on the back panel will make your back less sweaty. Just like the name suggests, some backpacks are designed to be carried from the back while others can be held form the front. Back facing carriers are the perfect for cyclists while front facing carriers are ideal when walking. Trust me, you need a bag that can serve your dog for a long period. Carriers that are made from quality materials such as canvas, nylon and polyester have proven to be durable. Likewise, it is advisable to check out customer reviews on any product before buying it. A lightweight pack is what you need when you hit the trail with your puppy. Such a backpack is easier to carry hence enhancing comfort during a hiking trip. Nevertheless, ensure that its lightweight does not interfere with the comfort or security of the dog. An adjustable pack makes it easy for one to achieve that customized fit that corresponds with their body type. This ensures that the bag fits snugly hence granting an enjoyable hiking experience. The efficiency of a dog carrier is as vital as any other aspect. Therefore, ensure that you get a carrier with the capability to carry more than just the dog. It should be able to accommodate a few more essentials for the dog such as a water bottle. The weather can be unpredictable at times. Hence it is always wise to be prepared for anything. Choosing a carrier with weather resistant fabric will guarantee your dog’s comfort and security regardless of the prevailing conditions. A waterproof material will prevent your canine from soaking whenever it gets rainy. Other that carrying your pooch, you might need to bring along a few more accessories or supplies. That is why you should have a carrier that is extensively pocketed on the exterior. Extra pockets provide additional packing space. Do not just fall for anything. Make sure that the backpack you consider is approved as safe and secure for your chubby pal. Can I carry my dog in a backpack? Are dog carrier backpacks safe? Dog backpack carriers make it possible for folks to carry their furry friends in a less strenuous manner. 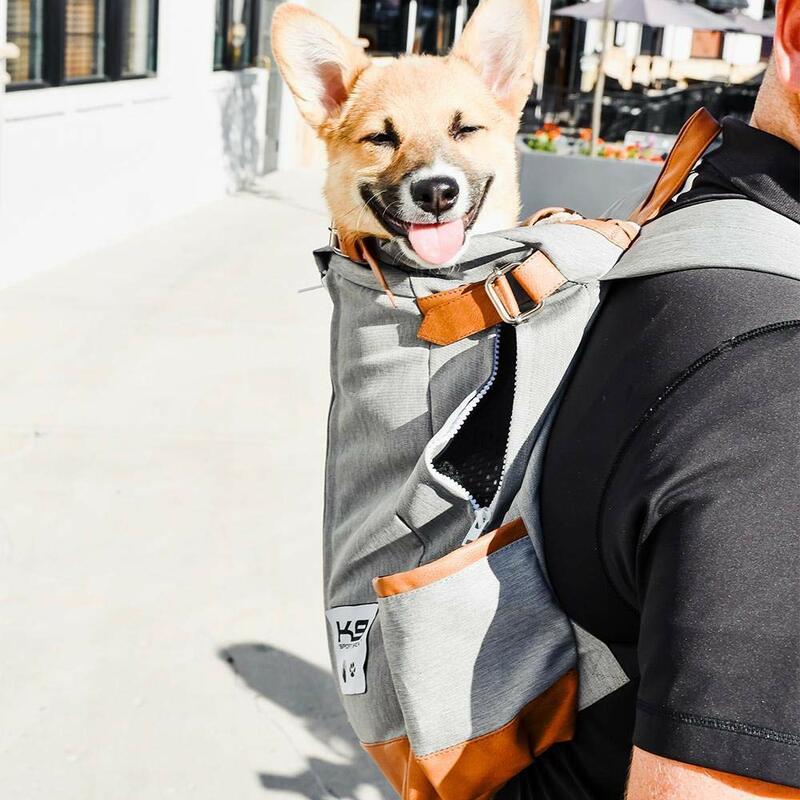 Unlike handbags or ordinary hiking backpacks, a dog carrier incorporates features that are specifically meant to hold a pooch. In most cases, the carriers can only accommodate puppies or small breed dogs. It would be strenuous and illogical to carry a German shepherd in a backpack carrier. 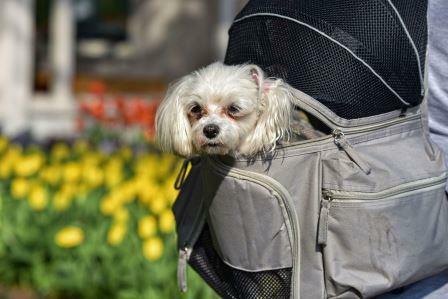 Nevertheless, the dog backpack carriers have proven to be very effective, convenient and secure. They are particularly incredible when cycling, hiking or showing a dog around town. Although some dogs like to walk on their own, carriers come in handy for dogs that have low stamina. Therefore, it is safe to carry your dog in a carrier backpack. The best dog backpack carrier ought to be safe, durable, comfortable and highly functional. It is always wise to have your dog’s measurements when buying a carrier so as to ensure that it fits perfectly. 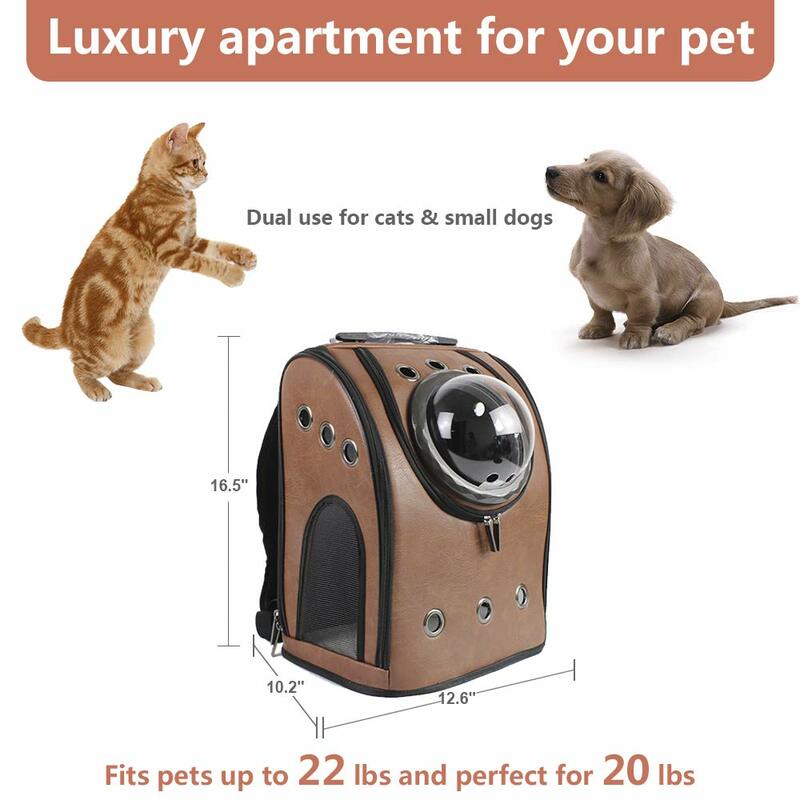 Finally, take time to go through the features and customer reviews before selecting an ideal carrier for your furry friend.